Re: New member welcome thread..
Curt! We have a great bunch here! Name is Paul. Picked up a cherry 2008 FZ6 and plan to upgrade the suspension. Open to suggestions on the front end, but I am definitely slapping Ohlins on the rear. I think the Andreani kit or the Matris kit is where I am sitting right now. I like the comp and rebound clickers on the Andreani setup. However, if they are stacked properly from the get-go, then the Matris units should be pretty solid. Any thoughts? Other than suspension, a new bar (FZ1 or something fancy) is about all she is going to get out of me. The rest of the bike is pretty much perfect for street duty and carving corners. Nice little place you got here. I will lurk quite a bit. I am getting too old for arguing in oil threads and slapping squids with ATGATT mantras. Welcome from Austria! A wider bar is definitely a nice improvement. Nice ride and nice garage! Welcome to the FZ6 Forum! Figured you'd find your way here. I had a 2004 FZ6 with the FZ1 bar. It was pretty good. I wish that was my garage. That is the office of the dealership I purchased it from. Hola, Chris. I will see you sometime this season, for sure. 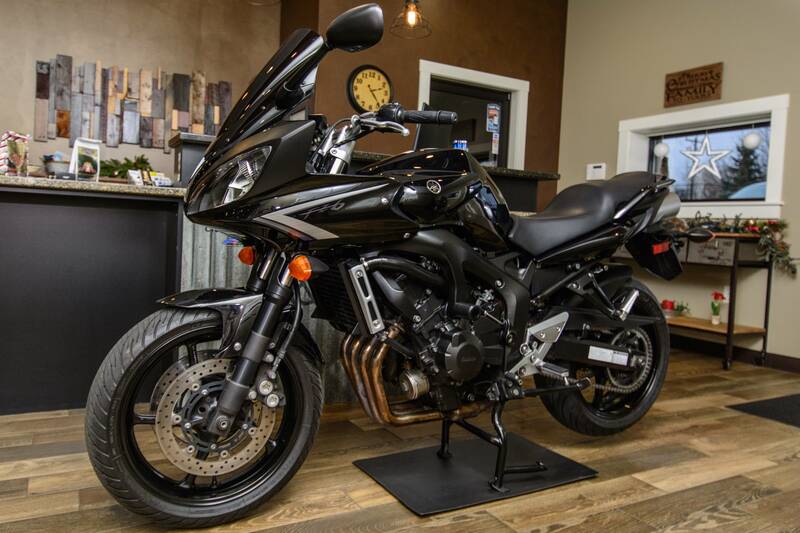 Purchased a blue 08' fz6 last night and plan on picking it up later today. It will mostly see commuter duty as I have a 15' KTM Super Duke 1290 R for play. First bike was a 80' Suzuki GS450S that I bought from a friends dad when I was in high school. After that was a 85' Kenny Roberts edition Yamaha RZ350 . I loved that bike! Took a break from riding when I started my family but returned to street riding in 05' when I purchased a zx11. Have had several Kawasaki's (zx11's, zrx's, a z750s), a Suzuki sv650, a BMW k1200s, and a Triumph Street Triple R.
new members from sunny........crap! when's this rain gonna stop California! Welcome to the world's best FZ6 forum. Lots of good info and good people. Nice looking fizzer. Good luck with your planned mods. You mention this is your first bike. Any previous riding experiance? The FZ is a great bike with a secret. Above 7k she's a rocket ship! But most importantly you will learn the skills to work the machind AND be introduced to toad strategies that. help you become a safer rider. Welcome aboard and stay safe out there.